Albert Bartlett was born in Shanghai. He went on to attend Colgate University. After graduation, Bartlett was selected for the Manhattan Project because of his background in physics. He worked with mass spectrometers at Los Alamos. He was part of the group that photographed the Operations Crossroads nuclear tests in the Bikini Atoll after the war. 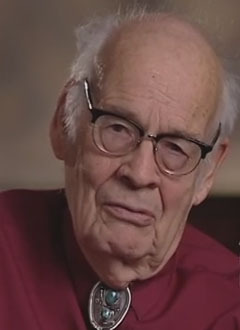 After the Manhattan Project ended, Bartlett earned his Ph.D. in physics from Harvard University and became a professor at the University of Colorado at Boulder, where he was a prominent member of the faculty. 1923 Mar 21st Born in Shanghai. 1944 Bartlett is selected for the Manhattan Project. 2013 Sep 7th Died in Boulder, Colorado.